The Reformation 2017 Edition of League of Confessors will no longer be available after August 9, 2017. Now we get to the most powerful hero ability of the game. See Nicholas von Amsdorf’s hero card above again. Notice that the 7th hero ability that he can get has a tiny flag on it. This is the Convert Hero ability. The Convert Hero ability has the ability to change the course of the entire game. If a hero is converted, that hero switches over to your league, but will stay in the same territory. Switch the hero marker to your color. You will now roll for each soldier in that army and territory to see if they will also convert to your side. Using the ability of the confessor who converted the hero, roll the same amount of dice for each soldier. Change the converted soldiers to your color. Unconverted soldiers are removed from play. If you convert the opponent’s confessor and they have one of their armies in that territory, the confessor is removed from play. If you convert a hero with an army with a confessor in the territory, the hero with the army is converted (don’t forget to roll for each soldier) and the confessor is removed from play immediately. The hero that is converted with their army is immediately in play on the very turn they switch to your side. The tide of war can turn around very quickly! Remember that, if your confessor is on a territory with a church, you still get to roll 1 extra die when trying to convert a hero. Do not forget to factor in the Publish ability and the Convert Hero ability into how you play this game. The pen is mightier than the sword! When his father died, Albrecht was actually raised by his uncle, George the Pious. However, you would never know it. Although brought up in George’s house, he never came to the same Biblical convictions as his uncle. Hostile by nature, Albrecht learned very quickly that a military career was a very practical move. And for the most part, he is very good at it. Whether commanding small armies or much larger ones, he lives up to his nickname, Bellator, which means “Warlike.” He is willing to use his skills for whoever is paying the most, which is usually Rome. Alcibiades is the starting Prince for Ferdinand I. If Charles V is the most powerful man on the planet, Paul III has the most influence. As the pope, his domain stretches way beyond the confines of the Holy Roman Empire, although the Hapsburg boys are supposed to be his favorite sons. With as much power as they have, even Charles and Ferdinand need to make sure they stay on his good side. Far less inept than his predecessors, Paul III is ready to tackle this reformation problem. He has the temporal and spiritual leverage to make people dance to his tune. Not to undersell this, but Maurice of Saxony is the most dangerous Prince on the League of Confessors game board. He is a master general who is capable of decimating large armies even with much smaller forces. He is the cousin of John Frederick the Magnanimous, but he has betrayed the Lutheran League by joining up with Charles V. He knows his ability in battle and sees this as his opportunity to depose John Frederick and become the ruler of all Saxon lands. This spells major trouble for any Lutheran army that tries to stop him. And to be honest, there is really very little standing in his way. Maurice is Charles V’s starting Prince. Johannes Eck could be considered Martin Luther’s oldest nemesis. By common consent, he was acknowledged as a foremost theologian of his day and possessed rare gifts in language and memory. And lets just say that he knows how to play hard ball. From the very early days of the Reformation, Eck had just one goal. That goal was to get Martin Luther to recant his teachings. If he doesn’t, Eck believes that Luther should be burned at the stake. Eck isn’t interested in having debates about the truths of Scripture. He is under the one church of Rome and the office of the papacy. In his mind, the big dude in Rome should never be challenged – ever. Any threat or opposition to the system should be put down by any means necessary. He is the starting Confessor for Charles V.
As is true in the lives of many great leaders, they are ushered into the pages of history by circumstances. Such is the case with Ernst the Confessor, prince of Luneberg. He was called upon to rule over his lands in a time of great squalor and confusion. With persistent leadership, he restored order on every level. Influenced by his uncle, Frederick the Wise, and the teachings of the Reformation, Ernst was ushered into his destiny. He is the most influential prince in Northern Germany and the only prince capable of slowing down the great traitor, Maurice of Saxony. And remember, Ernst does not bear the name “Confessor” because he is a pushover. His name went down third on the Augsburg Confession for a reason. Philip of Hesse is fortunate to have him as his starting Prince. Philip of Hesse is a starting Commander for the Lutheran League. He was mightily impressed by Martin Luther at the Diet of Worms in 1521, and in turn, actually began to study the New Testament. What a concept! Within a few years, he was willing to put his name on the articles of faith contained in the Augsburg Confession. Now that the Lutheran League has been formed to defend protestant lands, Philip is the league’s inspiration through his promotion and tireless recruitment. At times, he may be a little too good of a negotiator. He is often willing to bend a lot further than his ally, John Frederick. Regardless of his issues (for he was no sinless saint! ), Philip is certainly committed to the Reformation cause for better or for worse. Philip Melanchthon is a brilliant mind, an adept theologian, and a prolific writer, but oddly enough he is also the proverbially weak stick of the Reformation. As long as Martin Luther was alive, his gifts could be utilized with great proficiency for the furtherance of the evangelical cause. Relying heavily on Luther’s previous writings, Melanchthon penned the beautifully simple words of the Augsburg Confession. Luther approved of Philip’s work, but at times pointed out that he was not able to tread as lightly as Melanchthon. Philip can be converted because of his desire to make peace through doctrinal compromise. He is the starting Confessor for Philip of Hesse. George the Pious is the Magrave of Brandenburg and the starting prince for John Frederick the Magnanimous. He was a staunch ally of John Frederick’s dad, John the Steadfast, and now stands ready to defend the Lutheran cause. At the Diet of Augsburg, George spoke boldly when the Lutherans were forbidden by Charles V and Ferdinand I to continue in their teaching. George professed, “Before I let anyone take from me the Word of God and ask me to deny my God, I will kneel and let them strike off my head!” The entire territory of Brandenburg stands ready with their prince to engage the impending imperial invasion. With his father and uncle now dead, the rule of Saxony and the protection of all Lutheran lands has fallen to John Frederick. He is the leading force behind the formation of the Lutheran league and the defense of the Reformation. He begins the game as a starting Commander in the territory of Saxony. He went to great lengths to help spread the Gospel and was repeatedly threatened with death if he would not recant his Lutheran confession. Time and time again, he courageously refused to recant with calm and joyful defiance. He believed that if he would deny the clear teaching of God’s Holy Word, he would be committing a sin against the Holy Ghost. John Frederick is willing to back up his confession of this faith at all costs. He even Has the scar to prove it. Preceding the great event known as the Reformation, the setting was a horrific mess. The normal person who went to church didn’t know the teachings of the Bible or the Gospel of Jesus. They were unsure of their standing before the Triune God and certainly unsure of their calling. Why was it this way? What happened? How could this be? It happened gradually over time, but the Word of the Lord was put to the side for the rules, deeds, fasts, and feats of men. The whispers of the demons finally gained the edge within the walls of the church. In the subterfuge, only the best contenders for carnal righteousness rose to the top. The rest of the people were kept in the dark purposely and deliberately. It brought the powerful more leverage. It secured their envied positions. And, it created foul and unthinkable opportunities. In the darkness, the common people were frightened and confused. They were scared in life and scared in death. They were like defenseless lambs without a shepherd. With no assurance of the forgiveness of sins in Christ and no connection to the truth of God’s Word, they were prey for the wolves. They blindly followed any man-made proposition that was supposed to make them holier. As Rome began to offer purchasable forms of forgiveness called indulgences, they drew a hefty price. With the hopes of avoiding the fierce fires of hell, the people forked over what little they had left. The very Sheep for whom Christ died, were being bought and sold with each ring in the coffers. And with every consumer exchange, eternity wasn’t being delivered, it was being stolen. It is precisely in times like this, that men cower or go along with the flow. Systems get too strongly ingrained in the culture to contest them. Individuals, spouses, families, politicians, and clergy all jump on board. Once that current starts flowing, rarely do people stand against it. This is especially true when a faithful pastor or two tries to address the evil with Scripture, and they end up at the top of a stake. It was in this very setting, however, a man was seized by the truth of God’s Word and captured by the Gospel. His name was Martin Luther. The word that pierced his soul was from Romans 1:17, “the just shall live by faith.” As he posted the 95 Theses on the church door in Wittenberg and began to teach what the Word of God says about truth, grace, righteousness, mercy, holiness, and forgiveness, many others rallied to his side. The Word once again was doing its mighty work – creating saving faith (Romans 10:17). The common people rejoiced once more as the Good News was again preached to the poor (Matthew 11:5). It made its way up to the clergy, the professors, the princes, and even to the mighty electors. It was this bold profession of justification thorugh the completed work of Christ on the cross that both Frederick the Wise and John the Steadfast confessed on their death beds. This band of believers, who could no longer let go of the central teaching of the Holy Christian Church on earth known as justification, would go on to be identified as heretics, rebels, and outlaws. This band, which would come to be branded as “Lutherans,” would eventually form the Schmalkaldic League to defend themselves against the mighty forces of the Holy Roman Empire. The setting of LEAGUE OF CONFESSORS encapsulates the spiritual and physical struggle that took place after the death of John the Steadfast (1532) and the eventual signing of the Peace of Augsburg (1555). The picture above, depicts John the Steadfast, protesting the rulings of the Diet of Speyer in 1529. 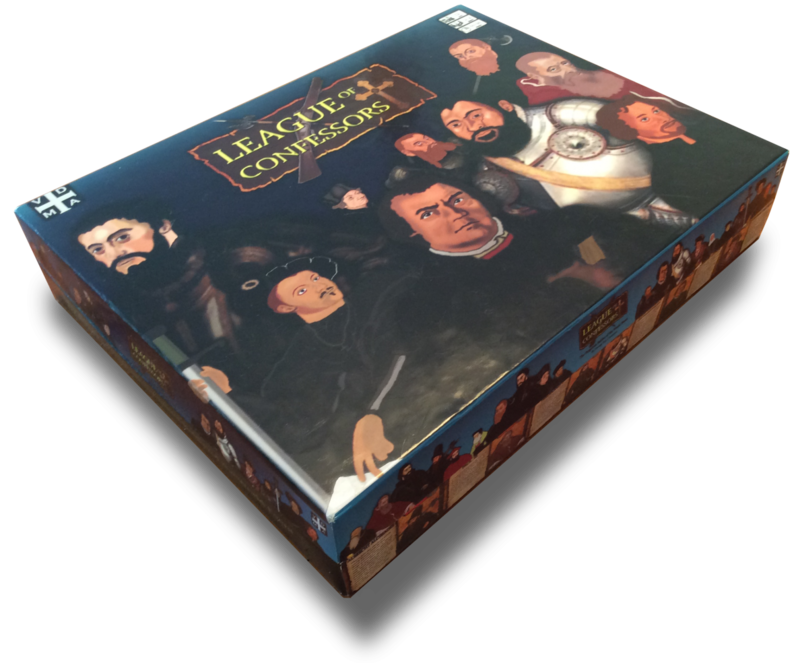 LEAGUE OF CONFESSORS is a simulation of the spiritual and physical warfare that erupted after the Reformation. It is the only game that covers the specific battles that took place between the Schmalkaldic League of Confessors (the Lutherans) and the Catholic League (Holy Roman Empire) between the years 1532-1555. The setting of League of Confessors begins after the death of John the Steadfast as the leaders of the Augsburg Confession prepare to defend themselves against the impending armies of the Holy Roman Empire. Power and wealth will collide with conviction and courage as two leagues of heroes go to war with sword and pen!